As you may know, Le Zoe Musings just celebrated her (yes, it’s a fabulous she) FIRST birthday! “Thanks” to all my readers for stopping by LZM for your daily dose of inspiration. To show my appreciation, I’ve teamed up with NAVOH to bring you this amazing Giveaway! Every fab female needs something fancy and compact to store her major credit cards and Id’s. Forget bulky wallets! 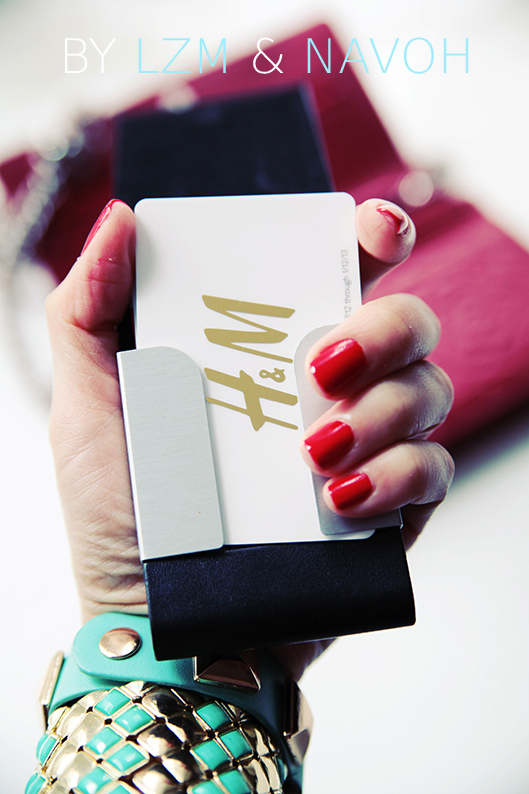 This crystal credit card case is small enough to fit in your hands and pockets. Perfect for those quick errand runs. 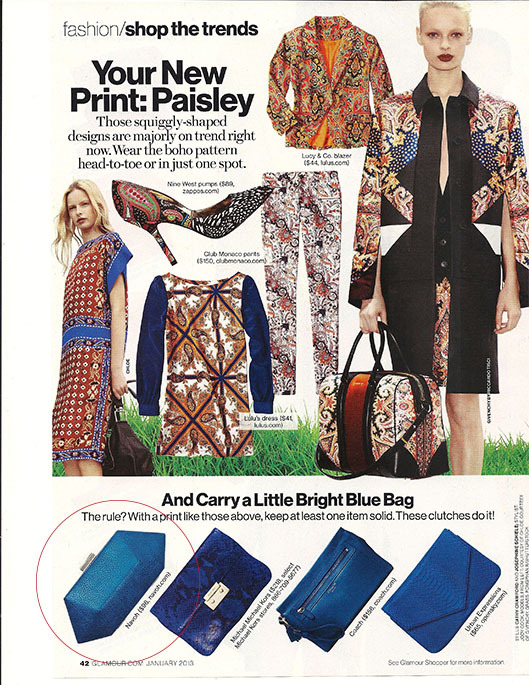 A line of affordable luxury bags, NAVOH has earned their mark on the pages of top fashion mags. Below is one of their latest feature! For me, the case is part of my city-strolling necessities. Here’s the deal- FOUR WINNERS will be chosen at random. 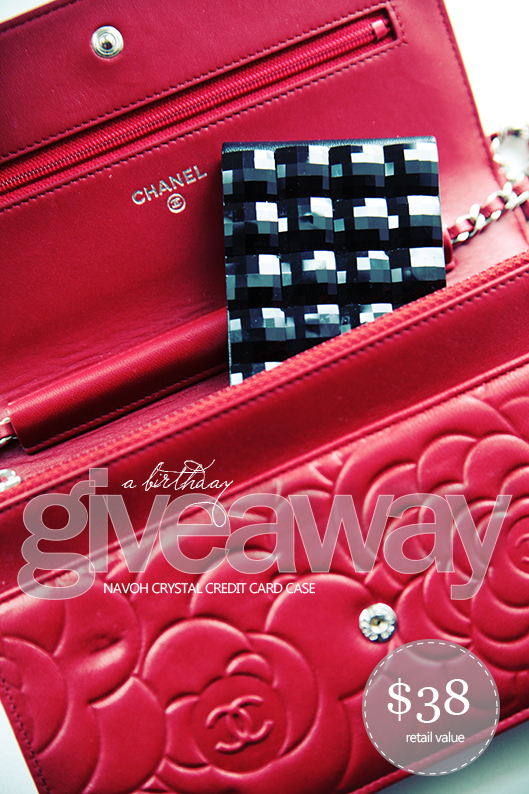 Each winner will win a NAVOH Crystal Credit Card Case in either Red, Royal Blue, Blush, or Black. 2. Leave a comment stating your interest in the giveaway and share what color’s your FAV. ENTRY DEADLINE- MONDAY FEB, 25TH MIDNIGHT EASTERN TIME. THE WINNERS (chosen at random) WILL BE ANNOUNCED HERE ON MY BLOG TUESDAY FEB, 26TH. You will have 48hrs to claim your prize, if not, you forfeit the prize. Please check back to see if you’ve won. BIG THANKS to NAVOH for sponsoring this Giveaway! Happy birthday! I really love the black case. It is compact and so classy! I reall love your blog. You have great style and creativity in fashion, food, arts and crafts and wonderful photography. As a mom of twins the credit card case would be a great item in my purse. It’s compact, can be used casually or formally and its classy! i love the black one! What a great giveaway! I love the blush case-it would be perfect to stick into my HUGE diaper bag! Thanks! This is the cutest compact “wallet” I’ve ever seen! I must have one 🙂 I would absolutely love the Blush colored one! Happy birthday LZM! Thanks for the lovely give away! My favourtite colour is the black! So classy! Reblogged this on Money Savvy Shopper. Normally I love my red accessories, but I seem to be drawn to the black one here. They’re all fantastic! The blue would be great, I’m starting a business and my business cards will need a home! Happy 1 year! That is definitely something to celebrate, as I approach 1 month! A giveaway is a great idea to celebrate…and I would appreciate any colour (i love surprises!!). Hope you did something fun to celebrate! I would love this practical credit card case for the days I am on the run and I only need the essentials, I would love it in the blush tone. Happy Anniversary! I adore the red one (my favorite color!). Happy One-Year for LZM! Your blog is inspiring and you always post something pretty and FUN to brighten my work day. I have a small but growing list of inspiration for DIY projects I’m incorporating into projects from LZM. I would LOVE the black card case. I cycle between big, colored wallets that don’t fit in my jacket pocket for a quick run out, and small ones that aren’t quite as stylish. The one from NAVOH would definitely fit the ticket for pocket sized and cute. Happy posting to you, and looking forward to more posts – and perhaps a random win of an awesome, fashionable, and practical find:-). Happy birthday! Time is flying, I been with you guys here almost from the beginning and I want to wish you lot’s of inspiration and many years and hundereds of awesome posts to come! Happy 1st Birthday! What a generous way to celebrate a birthday. Either black or blush is great for staying organized on the go. Happy 1st Birthday!! Love the idea of a giveaway (which I would have thought about that!) 😉 I like the Red, and I agree with a pop of color, you can never have too much color when your wearing darker colors! Wishing you the best from here, and many more birthdays in the future! I love your giveaways! They are always so incredible. Love your blog. You live such a cool life. I love the blush color. So pretty! Once again congratulations on your blog’s FIRST birthday, growing up just as quickly as Miss Zoey! I am very interested in this giveaway and if chosen a winner, I would like the Red case so I can find it at the bottom of my purse – lol! Thank you Zoe for the great giveaway. I would love to win the red one because I think it’s a beautiful pop of color. I have so many black dresses sometimes you just need that extra bit of eye catching color. Also, I’ve never really tried a credit card case before. These seem like they would be a glamorous introduction! Hello! Great post and great blog! Looking forward on seeing more! Having a giveaway for your blog birthday is a great idea! I always thought it was interesting and totally fabulous that people were able to collaborate giveaways with chic and modern stores. And I’d have to say the Classic Black is by far the most stunning! Love the idea and style of these cases and I love the blush but would use any color! Happy 1st birthday LZM! This is a great idea. Having a bulky wallet is such a nuisance. I really like the blush colour. I’m looking forward to your next post. Hi! Love your blog for random musings. I don’t use Facebook (so can’t like you there!). However, I would love to win the black Navoh case. hey Happy birthday to LZM first of all… Your blog is certainly one of the good ones here… Giveaway is awesome! i love the Red Case! Following on facebook now too. Love the black! Love this giveaway! I think I’d have to choose the black one! You find me in FB as Francesca Scaroni! I love this giveaway, but I can’t decide! I guess… I’ll go with… Blue! Those are so cool. I love the red! What a lovely giveaway! I’m loving the blush case. I like your page on facebook already, and I follow your blog via bloglovin’! As a working mom, I need all the help I can get to stay organized! I’d love the red case. Thanks! I’m a girl who’s always on the go, so one of these adorable credit card holders would be the perfect accessory to make my life easier. I love it in black–very chic! Thanks for hosting this awesome giveaway. I’m a girl who’s always on the go so an adorable credit card case will be the perfect accessory to help simplify my life. I adore the black case; it’s very chic! Thanks for hosting this awesome giveaway. This is awesome! I would love to take part in this give away! I already liked your post about the case and as I am constantly loosing my credit card. I once lost it at Singapore Airport before a 2 1/2 months (!) journey to Australia… what would I have done without money at the other side of the world??? Horror Scenario but luckily there was a very honest person who found it and gave it to the information desk who then called for me…. You see, I really really need this case as I would probably take care of this stylish piece!! !